Honig’s, headquartered in Denver, Colo., will remain the Official Apparel Partner of the FIL for the 2019 Women’s U-19 Lacrosse World Championships, 2019 Men’s Lacrosse World Indoor Championships and 2020 Men’s U-19 Lacrosse World Championships as well. 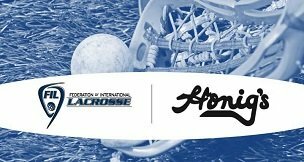 “Lacrosse is one of the fastest growing sports in the world, and we are proud and thrilled to partner with the Federation of International Lacrosse and its officials,” Greg Wilson, CEO of Honig’s said. “Honig’s has led the way in officiating apparel for over 30 years, and our goal is simple: Ensure that officials look great on the field — and we are excited to watch the 2018 games, and watch the officials walk on the field in the best apparel in the industry. For more information on the 2018 World Championships, go to WorldLacrosse2018.com, and the tournament’s social media pages @WorldLax2018 on Facebook, and @WorldLaxChampionship2018 on Instagram. For more information about Honig’s and their products, visit Honigs.com; and follow them on Facebook @Honigs, and on Instagram and Twitter @HonigsOfficial.